The initial idea for this website came up when we wanted to document the ecological work of our highschool which is located in the southern part of the Ruhr-district in Germany, thereby creating an online catalogue of the species occuring in the surroundings of our school. The focus was on the microscopical life in aquatic freshwater environments, i.e. a small pond that has been surveyed for more than 10 years before it was replaced by a new pond. A nearby brook complements the biodiversity with species typical for lotic waters. The first update followed when the biological (marine and terrestrial) results of our excursions to the mediterranean sea were added. If one tries to identify microscopical organisms it soon becomes evident that certain species can only be unequivocally identified by comparing them with other closely related species from other habitats. Therefore the online catalog now covers species collected and studied from other locations, first within Germany. One emphasis is now on rotifers. So discoveries from locations of adjoining European countries are included as well. About 450 taxa of rotifers are documented up to now. Also the section of the marine species has undergone an update by adding images of species from several diving excursions in tropical sea areas. The monogonont rotifer Cephalodella stenroosi was found in a pond in Hattingen. The hymenostomatid ciliate Turaniella vitrea from the Heierbergsbach in Wodantal. Also the euglenoid flagellates Phacus smulkowskianus and Trachelomonas ellipsoidalis were found there. A bdelloid rotifer that looks like a variation of Macrotrachela decora was found on a layer of Trentepohlia-algae in the vicinity of the "Kapellenplatz" in the forest south of Warstein. In a sample of the Simmelried near the "Bodensee" a specimen of the oligochaete Nais sp. was found which had been infested by the ciliate Rhabdostyla inclinans and the rotifers Cephalodella parasitica and Albertia naidis. In the course of the Hiddensee-excursion of the Berliner Mikroskopische Gesellschaft, which had been kindly organized by W. Bettighofer (protisten.de), a lot of interesting microorganisms were found. The findings were influenced by (1) the special environment of the Hiddenseer Bodden and (2) by the focus on organisms that had settled on the surface of microslides that had been exposed in certain liminic and marine environments some weeks before. Some of the species that were found are ciliates like Tintinnids; Aspidisca crenata, Folliculina boltoni, Thuricola folliculata; algae like Pediastrum tetras and rotifers like Colurella dicentra, Encentrum marinum, Testudinella clypeata. The complete list of the documented species is here. For the preparation of a meeting of the Naturwissenschaftliche Vereinigung Hagen, some samples were collected from Sphagnum ponds in Griendtsveen/ Netherlands. Some species found are: Collotheca coronetta coronetta, Keratella ticinensis, Lepadella minuta, Microcodides chlaena, Proales doliaris, Synura sphagnicola, and ciliates like Halteria grandinella, Holophrya sp., the hypotrich ciliate Urostyla grandis and its parasite, the suctorian Podophrya urostylae. Ankistrodesmus fusiformis, Brachionus diversicornis, Cephalodella biungulata, a special morphotype of Dicranophorus hauerianus were found in a trench in Bourg Blanc. Rotaria sordida was found in LeConquete. Some interesting rotifers and protists were found in the harbor ground of Portsall and some tidal pools from the coast of Britanny/ France: Encentrum marinum, Colurella uncinata. Some Ciliates like Enchelys sp. feeding on a ciliate, Diophrys cf scutum, Mesodinium sp./ Myrionecta sp., and the phagotroph dinoflagellate Oxyrrhis marina. A bdelloid rotifer that looks like Habrotrocha ligula has been found in the nature reserve NSG Koffituten near Hopsten (Tecklenburger Land), but also shows some differences. Arnold Büschlen, an expert on mosses (swissbryophytes) sent some samples of the liverwort Frullania digitata, the amphigastria of which host a special fauna of bdelloid rotifers like for example Habrotrocha annulata, Mniobia symbiotica or Mniobia scarlatina. The "plankton course" at the biological station of the NSG Heiliges Meer is always a rewarding event: Because of the variety of waters and wetlands in the NSG, this course is ideal for people who like to study the microscopical life of limnic waters. In addition to the opportunity to observe the aquatic life using the available (or one's own) microscopes, the course offers the opportunity to learn a great deal about the interaction of abiotic and biotic factors in the ecosystem "lake" through the practical measurement of physical and chemical data in conjunction with presentations. Besides diatoms and other algae like Synura spinosa some protists like Vorticella aquadulcis or Coleps hirtus and some rotifers like Collotheca trilobata, Kellicottia bostoniensis, Gastropus minor or Synchaeta with parasites could be found. A trip to the islands of Spitsbergen (Svalbard) revealed some rotifers which have not been covered on this website beforef Encentrum uncinatum and E. permolle, and some Bdelloids like Habrotrocha elusa and a strange morphotype of Adineta cuneata. At the end of September 2017 the traditional meeting of some microscopists from Austria, Switzerland and Germany took place in the beautiful location in Bodman at the Bodensee. In samples from the Bodensee, Mindelsee, and the "Simmelried" some rotifers were found, among others Beauchampiella eudactylota, Collotheca mutabilis, Colurella tesselata, and Mytilina bisulcata, some microscopic details on Squatinella mutica and Trichocerca intermedia. thSome Euglenoids like Trachelomonas ellipsoidalis and Trachelomonas verrucosa var. granulosa have been found as well. As a supplement to the paper of Iakovenko et al. (2015): "Antarctic bdelloid rotifers: diversity, endemism and evolution" some images of the species described are presented here. In this survey some new species have been discovered, for example Adineta coatsae, Habrotrocha vernadskii or Macrotrachela jankoi. Others are endemic like Adineta editae or Habrotrocha angularis. The whole list of the documented species in this website can be found here . A sample from the "Elisabethquelle" in Bad Frankenhausen/ Südharz revealed some interesting organisms, among others some special protists like Loxophyllum verrucosum, Chlamydodon triquetrus and Lacrymaria salinarum. The rotifers include Encentrum marinum and Lecane arcuata. Also some autotroph organisms were found: Enteromorpha sp.and Melosira nummuloides. Proales doliaris and Brachionus urceolaris from Griendtsveen/NL; Arcella artocrea; Macrotrachela nana ligulata; Habrotrocha collaris with parasites; Rotaria citrina from Ebbemoore/ NRW, Aspidiophorus silvaticus and Encentrum martoides from Norway, Euastrum binale; ; Closterium navicula. Anilao in the Batangas area of Luzon/ Philippines is one of the most rewarding dive locations in the world for underwater macro photographers. But this is not all. A moss sample collected in Club Ocellaris revealed some interesting bdelloid rotifers, among others a new form of Adineta. Pourriotia werneckii (Proales werneckii), Encentrum marinum and Cephalodella cf. tenuior have been found in pond near Hattingen, Germany. New images for Macrotrachela multispinosa var. brevispinosa, Macrotrachela plicata var. plicata, Philodina flaviceps, Philodina rugosa, Rotaria sordida, Floscularia melicerta. Abrochtha intermedia has been found in an ephemeral puddle in Hagen/ Germany. Although this species is supposed to be cosmopolitan this may be the first discovery of A. intermedia in Germany. Updated information for some rotifers, desmids and protists. How does Floscularia ringens build its tube? ; Some photographic insights in the morphology of the tube building organ. New images for Philodina roseola. New Cosmarium (C.margaritiferum) added. Updated information for the monogonont rotifers Lecane hamata, and the bdelloid rotifer Adineta vaga. Images of the desmids Cosmarium margaritatum, Cosmarium tetragonum, Cosmarium speciosum and Closterium archerianum added. A new ciliated protist with lorica Vaginicola cf. terricola found in a moss sample. 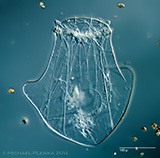 Updated information for the monogonont rotifers Colurella obtusa, Encentrum mustela, Keratella ticinensis, Pleurotrocha petromyzon, Pleurotrocha sigmoidea, Squatinella mutica var. mutica, and the bdelloid rotifer Philodina citrina. Images of the protists Euglypha acanthophora and Wailesella eboracensis added. A strange kind of Scepanotrocha, probably S.parva, Habrotrocha flaviformis, Macrotrachela festinans and Macrotrachela petulans have been found in NRW. New images for Proales fallaciosa, Urocentrum turbo and Blepharisma lateritium. Encentrum permolle, Macrotrachela nana, Macrotrachela musculosa, a strange kind of Adineta gracilis and some Tardigrades from James I Land, Svalbard. Macrochaetus subquadratus and some nice protists like Chilodonella caudata and Coleps amphacanthus as well as Trachelomonas armata were found in a bog of the Simmelried venn. Asplanchna priodonta var. henrietta and Brachionus diversicornis were found in Bohemia, Czech Republic. Notommata pachyura pachyura, a rotifer that can get very big has been found in Hattingen. Some insights into the digestive system of Collotheca pelagica. Beauchampiella eudactylota has been found in Mecklenburg-Vorpommern, Germany. Tetrasiphon hydrocora has been found in Mecklenburg-Vorpommern, Germany. 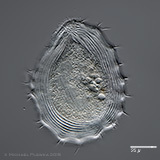 Some new images for Scepanotrocha rubra, Cephalodella gracilis and Lecane agilis from new locations. Kellicottia bostoniensis has been found in the Ohligser Heide, NRW, Germany. Enteroplea lacustris has been found in the "Rotes Moor" in Mecklenburg-Vorpommern, Germany. Three years ago the rare rotifer Ptygura rotifer (Pseudoecistes rotifer) had been rediscovered in the Wahner Heide near Cologne. Now the newly described bdelloid rotifer Otostephanos jolantae has been found there. This is probably the first record for Germany. The monogonont Trichocerca cavia could be documented for this location as well. Macrotrachela zickendrahti has been found in a nature reserve Oberrasen/ South Tirol. This rotifer looks pretty weird with its bizarre spines. Some new desmids and chlorophyte alge from the Alps and other locations have been added to this site, among others: Cosmarium holmiense, C. subundulatum, C. venustum, Cylindrocystis crassa, Desmidium grevillei, Hyalotheca mucosa, Euastrum ampullaceum, Euastrum crassum, Tetrallantois lagerheimi, Westella botryoides, Xanthidium bifidum. The eversion of the daughter coenobia of Volvox could be observed. At the beginning of Oct. 2014 various soil and moss samples were collected in the Alps of South Tirol. First examinations reveal the rotifers Adineta vaga var. rhomboidea, Adineta tuberculosa , Dissotrocha scutellata and Macrotrachela punctata. A variety of Pleuretra lineata has been found as well. A new pond in Hattingen/NRW reveals some rotifer species not yet described on this site before: Trichocerca bicristata and Testudinella incisa. Hexarthra mira and Collotheca pelagica were found as well in this pond. The bdelloid rotifer Rotaria socialis from the water reservoir Wuppertalsperre. The hairyback (gastrotrich) Aspidiophorus silvaticus has been found in a forest near Hattingen. Its habitus is quite unusual for a gastrotrich and resembles that of the rotifer Bryceella. The bdelloid rotifer Scepanotrocha simplex has been found in a forest near Hattingen. Asplanchna sieboldi var. cruciformis etc. Images for Asplanchna sieboldi var. cruciformis. Corrections and new images for Adineta barbata and Synchaeta longipes. The "Pillerseetreffen 2014", held in Tirol, Austria, revealed some interesting rotifer species new to me, e.g. Collotheca edentata, Habrotrocha angusticollis, or Habrotrocha curvicollis. Some new images of Macrotrachela quadricornifera var. quadricornifera, Notommata allantois, Notommata groenlandica, Philodina flaviceps and Philadinavus paradoxus are on exhibition now. 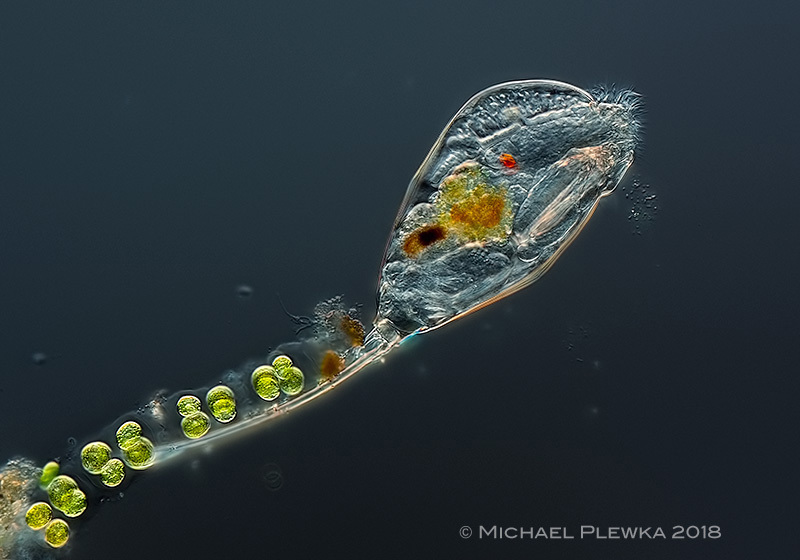 The rotifer Proales minima found in a bavarian pond. Already in May 2014 some interesting rotifers could be found; eg. Filinia terminalis, Asplanchna (Asplanchnella) girodi, Conochilus dossuarius, 2 variations of Keratella cochlearis and Keratella quadrata and the rare Notholca psammarina. The rotifer Habrotrocha novemdens found in a bavarian forest. The rotifer Dorystoma caudata found in a bavarian pond. Notommata pseudocerberus found in a bavarian pond. Trichocerca bidens found in a bavarian pond. Observing rotifers for more than 15 years sometimes leads to finding some specimens that are not described in the literature (as far as this literature is available through libraries) or sources from the www. Here are some of them. Macrotrachela habita found in Hattingen, Germany; images of specimen from Italy added.